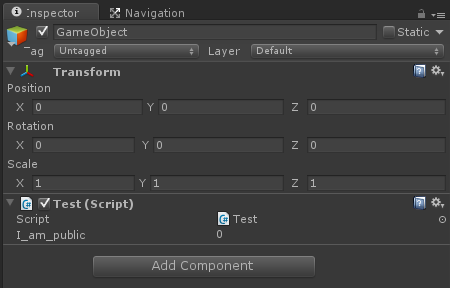 Unity has a powerful feature that helps us to modify values in the Inspector without any programming at all. 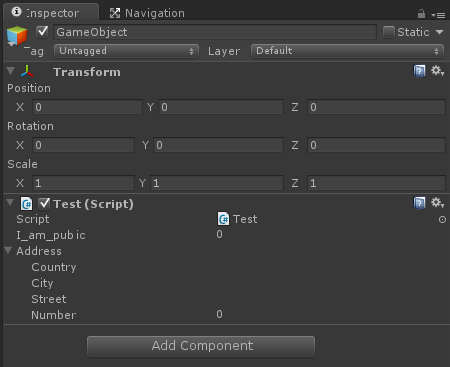 This article covers everything we need to know in order to show our variables and our custom classes in the Unity Inspector. We can see that it has the Test.cs script on it, but we don't see our something variable at all. Let's modify our script by adding another variable, but this time with the public prefix. In programming languages, public means that the value can be seen by other classes too. 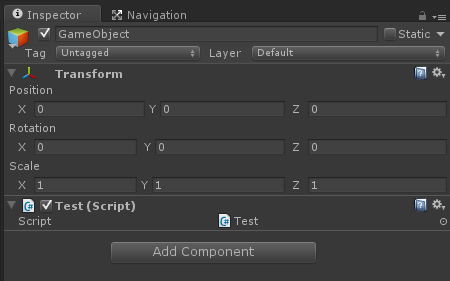 In Unity public also means that the variable is shown in the Inspector. Now we can easily modify the variable without opening the script again and without doing any programming. Even though we made the address variable public in our Test class, we still don't see it. The reason is that it's not a Unity class like "public class Test : MonoBehaviour" (each component needs to be :MonoBehaviour, but there is no reason for a simple class to be :MonoBehaviour). Most people stop here and think that it's just not possible to show our Address in the Inspector, but it actually is. Here is the trick: if a class should be shown in the Inspector, we just have to tell Unity to do so by writing [System.Serializable] above the class declaration.